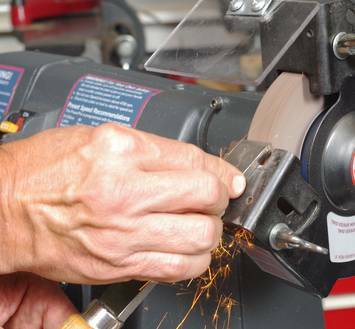 There are a wide variety of options at your disposal when seeking the perfect bench grinder wheel. Going to the home improvement store and trying to determine it all yourself can be an expensive and unnecessary hassle when you have the internet at your disposal! In this guide, we will examine some of the top choices of bench grinder wheels on the market. We will take a look at the pros and cons as well as the price point for each wheel. Power on! We have assembled 4 bench grinder wheels that we believe will include the best one for you. They range in price, quality, and material so surely one will fit your needs. 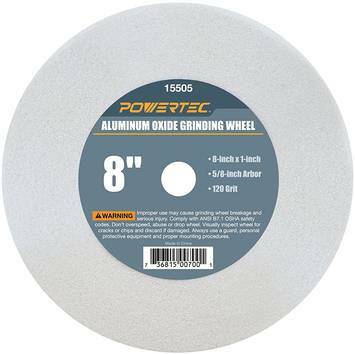 The 15505 by POWERTEC is a powerful white aluminium oxide grinder wheel with a grinding surface you can rely on. The abrasive on the surface of the 115505 is designed to rub away, ensuring that your grind is fresh and smooth every time. In addition to it’s durable white aluminum design, this bench grinder wheel is designed to fit on most bench grinders, making it a flexible choice. This wheel is an ideal choice for any work involving steel. Buyers of this wheel have been mostly complimentary of it, praising its ability to leave a smooth and perfect finish on both steel and wooden tools. The word “fine” seems synonymous with the buyers, as the finishes on their projects come off smooth and clean, making it a great tool for fine sharpening. This is arguably the biggest strength of this particular bench grinder wheel. On the other hand, some of the more unsatisfied buyers of the POWERTEC 15505 claim that the durability of the wheel itself is questionable. Some buyers reported their wheels being chipped or damaged right out of the box. A few buyers reported that their wheels would break after one use while another bemoaned the lack of apparent customer service in getting his wheel replaced. 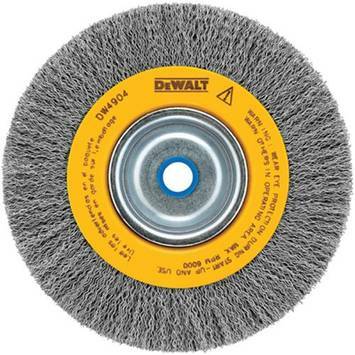 The DeWalt DW4904 Crimped Wire Wheel Brush is a carbon constructed brush that appeals to those hobbyists that enjoy durability and balance when it comes to the performance of their bench grinder wheel. The DW4904 features a crimped wire style that promises to quickly chisel away imperfections on your projects. 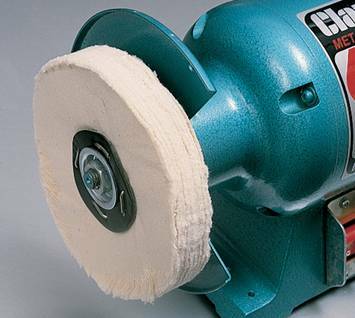 This grinder wheel is ideal for shaving away bits of rust, scale, and paint on various material surfaces. Customers of this wheel have overwhelmingly praised it, focusing on the outstanding quality of the product, especially when it’s low price point is a consideration. All of the positive reviews showcase the performance of the DeWalt, which is consistent with the promises on their store page. Many others describe the grinder wheel as maintaining the perfect balance on a grinder, which is rare when it comes to a wheel that is offered at a lower price. As far as negative reviews go, some customers reported that the vibrations of the wheel inside of the greater were very intense. One customer reported that the vibrations were so heavy and quick that a lamp next to his work table turned off due to the shaking. One customer reported that the sizing specifications on the product page were wrong which made him very disappointed with the product. 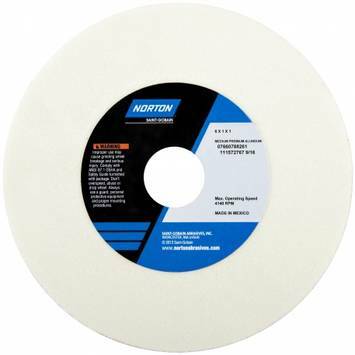 For those looking for a more high-end and customized experienced in your bench grinder wheel, Norton has you covered! Their grinding wheel product line is high quality, featuring a wide variety of sizes, grit types, speeds, and item measurements. The Type 01 boasts 9 different varieties of wheel, making this the choice for those who like to get technical about their grinder wheel specifications. Reviews of Norton’s Type 01 line are variable, which seems expected given the variety of sizes and shapes available. The most positive featured review online praises the necessary addition of Raptor R3X bushing in order to make the wheel perfect and ideal. Other positive reviews praise the versatility of the product while cautioning towards doing research to ensure you have the right sized wheel. Some positive reviewers who accidentally bought the wrong size were easily able to acquire adapters through Norton’s customer service. On the negative side of things, buyers reported instability and feelings of unbalance when the wheel was attached to their bench grinder. One user warned to listen to the reviews as he did not and found his wheel to be dangerous when it was wobbling around. A few mid-level reviews also described an issue with materials slightly flying out of the wheel upon first using it. These users did report that this only happens with the first few uses. As for price, you will find the Norton Type 01 series to be variable based on the size and speed that you need. The cheapest offering sells for $21.99 while the more expensive, high-end models sell for $58.99. 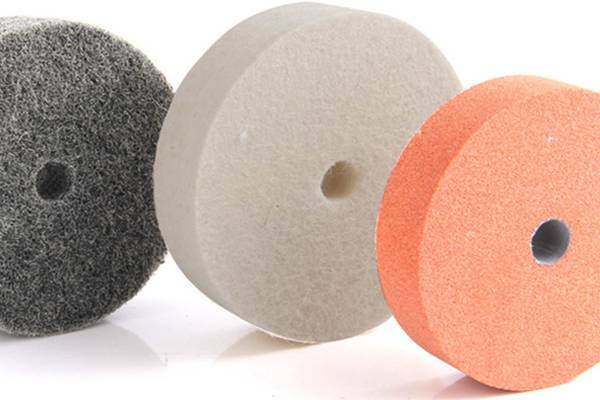 The PC 8" X 5/8 ” soft cotton wheels are a unique choice for a hobby enthusiast that is out to get a clean buff or polish on the surface of whatever job they may be working on. These wheels are ideal for giving metal a shiny, unbeatable polish. They come at a value in which you get two wheels that are fit for a ⅝ hole size on an 8 inch grinder. This may be the wheel for you if you are looking to sensitively polish using cotton, which can look really nice on certain metals such as brass and steel. Reviewers of the PC product are mostly positive, praising the thickness of the doubled cotton in ensuring a smooth and shiny finish. Other reviewers were happy with the applicability of the wheels towards their smaller projects, finding them to be the perfect choice that was unavailable in their neighborhood hardware store. Applicable projects ranged from polishing truck wheels to restoring the quality of brass musical instruments. All of these uses were praised by the reviewers. 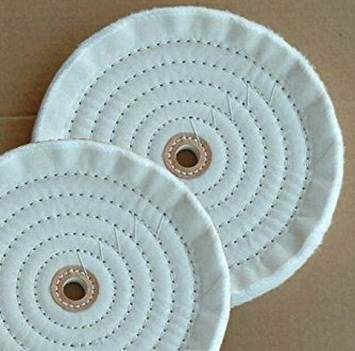 There were not too many negative things said about the cotton polisher wheels, possibly due to their specific use. From the few negative reviews, one customer reported shreds of cotton flying off the buffer during use. More than one customer reported that they only received one of the promised two cotton wheels, although it was unclear whether or not they contacted customer service. It can be hard to identify the best bench grinder wheel for your workshop. The truth is, the best grinder wheel depends entirely on what your personal project requires, and whether or not you are willing to pay a higher price point to ensure a durable and accurately sized wheel. Nevertheless, it’s important to trust the reviews of consumers who have bought the project. You would not want to be on the unfortunate end of a dislocated bench grinder or a workshop disaster due to cheap grinder wheel quality. Best value/Best quality on this list? If you’re trying to determine which one of these bench grinder wheels is the best item, the DeWalt DW4904 is the best bang for your buck. At it’s low price point and consistently reported durability and effectiveness, you can be sure that this is a high quality investment on your part. What is a Bench Grinder Wheel? How Does a Bench Grinder Wheel Work? Bench Grinder lies in the classification of benchtop grinding devices which are used for driving abrasive wheels. Bench Grinder consists of bed fitted to hold the work piece and is used for hand grinding of cutting tools as well as rough grinding. It depends on the grade and bond of grinding wheel. The grinder works by removing material through abrasion from work piece in progress of cutting which may generate a lot of heat. A coolant is incorporated for cooling the work piece when temperatures go higher. Most of the bench grinders’ wheels are the vitreous-bond type of wheels. These wheels work best achieving the task they are intended for although they still inhibit cracking risk. Softer grinding metals such as aluminum are not grinded using wheels which are designed for hard metals such as steel. These soft metals are lodged in wheel’s pores which later on expand due to the grinding heat produced. Such an occurrence may dislodge grinding wheel pieces leading to an injury. The paper blotter of the wheels come printed with the maximum ratings of RPM. Then the RPM of the grinder should either be lower or equal to the maximum speed of operation which is indicated as maximum on the tag on the grinder’s wheel as not to be exceeded. If the grinder wheel is over sped, it may explode which is dangerous as it can either kill or injure the operator similarly to a gunshot. Tool rest should be very tight and also fitted within 3 to 2 millimeters of the grinder wheel. The reason behind this is to prevent any slipping of work piece down between tool rest and wheel. Spark arrestors are used for catching stray sparks. Grinding occurs as work piece is on tool rest for prevention of sudden slips whereby the wheel momentarily grabs work then yanks the wheels out of the hand of the operator or else pull to the wheel side the hand. Bench grinder whose wheels are designed for periphery grinding are highly prohibited to be used on a bench grinder for side grinding. The biggest threat with using the peripheral for side is a wheel explosion. Some cutter and tool grinders have wheels which are cup-shaped which can do side grinding. When you are grinding metal on grinding wheel which is driven by power the work piece is heat up quickly. Many bench grinders have no coolant as they are the dry kind but then it requires often dipping of the work piece in pan of water so that it cools in order for it to maintain its temper or burn the hand of the operator. The pans of water for easy reach and safety are mounted under the grinder. Frequent dipping in water is needed for high or medium carbon work pieces as they are already tempered and hardened to avoid high heating which is followed by quenching substantially hence destruction of heat treatment already in existence. Grinders used for sharpening knives are the wet kind whereby its wheel bottom has a coolant. You can also incorporate a tube on the wheel’s top for delivering the coolant in a stream. Such grinders are classified in benchtop grinders’ class. Wheel guards are used for intercepting fragments of a wheel which has exploded for them not to damage the surroundings or kill people. This explains why grinders with no guards are not allowed. These are the most common wheel style. This style is only used for periphery and hence produce a surface which is slightly concave. Straight wheels generally are used on centerless, surface and cylindrical operations. These type of wheels are varied in terms of width, diameter and size of face depending on work class it is used on and the machine’s power. These are the grinding wheels fitted with industrial diamonds which are bonded on the periphery. Used to grind very hard materials like concrete, gemstones or carbide tips. Used for grind twist drills and milling cutters. Common in areas with no machines as such areas make use of saucer wheels to maintain blades of the saws. This is the straight wheel which tapers the outward directing it to the wheel’s center. Unlike straight wheels, there arrangement is stronger to accept loads which are highly lateral. Used for primarily grinding gear teeth, thread. 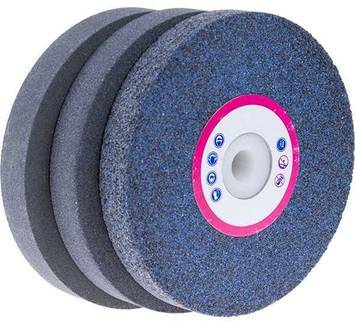 This are the most shallow cup designed grinding wheels. The wheel’s thinness allows crevices and slots grinding. Used for jig and cutter grinding. Also called parting wheels. These are wheels which are self-sharpening, with thin width and fitted with radial fibers for reinforcement. Used often in construction industry to cut reinforcement bars. The wheels are usually 5 inches by 18 inches. Grit form part of abrasives on grinding wheels which ae grains and grits. Grains are the ones which cut the metal while the grits are responsible for holding together the grains as they are cut. Wheels structure is determined by the spacing of grit and grain. The choice of a wheel is dependent on the way in which the wheel will interact with work piece. Ideal choices should be able to remain sharp with less dulling as it creates other cutting points when it becomes dull. The vitrified bond of the wheel is based on glass and it’s made through feldspars and clays vitrification. Bench Grinder rubber wheel bond is made from Synthetic rubber or natural rubber. The grinding wheels resinoid bonds are based on resin. The resin is made from distillates of petroleum or plants. SAFETY TIP: Easy way to check your bench grinder wheel before using. Bench Grinders can be the ideal option for standard equipment to be used in machine shops as well as metal fabrication centers since they are grinders which are handheld easy to handle.